As you can see, it is a simple oval, with some colored shapes inside the body, and a row of little hairs around the edge – simple enough to make with some fleece, felt, and pom-pom trim! This is a great project for you to do with your children since there are so many things they can do in the process. I didn’t take photos of the actual project in process, but the tutorial is fairly straightforward (I hope!). 1. 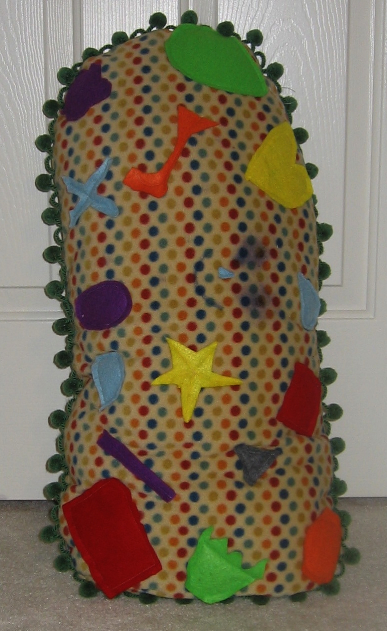 Starting by drawing 10 – 12 different shapes on the felt. Use a variety of colors and shapes to add interest. The shapes should be various sizes ranging from 2 x 3″ to 6″ x 6″. Shape suggestions: circle, square, rectangle, triangle, oval, egg, dome, X, star, straight ling, squiggly line, tulip, flower, pentagon, octagon, trefoil. 2. Cut out the shapes and set aside. I found the shapes to be the most fun for my son. He drew and cut out all the shapes by himself. The bonus was that this kept him busy for about 2 hours (off and on) which gave me time to sew some other project. 3. Take 1/2 yard of fleece and cut it into two equal-sized rectangles (it’s easiest just to cut where the fabric was folded on the bolt). These will be the front and back of the paramecium. 4. 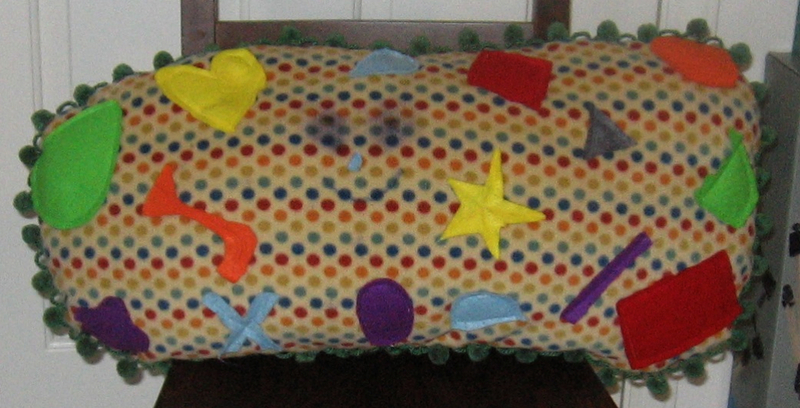 Take one fleece rectangle and arrange the felt shapes on it. Again, my son did this step. He took each piece and placed it where he wanted on the creature. Be sure to leave about 1 – 2 inches seam allowance around the perimeter. 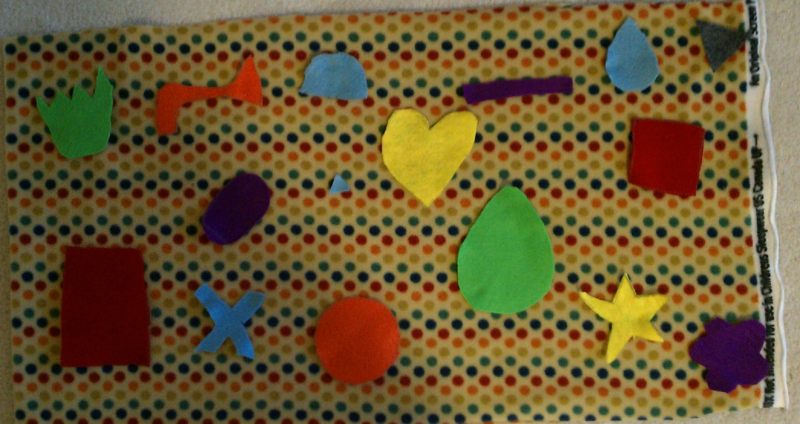 Pin the shapes to the fleece. 5. Using your machine, stitch the shapes onto the fleece. Stitch on top of the shapes (basically like raw-edge applique). Since this was a toy, I just stitched around the inside edge of each shape, leaving the edges of each shape raw. Don’t be a perfectionist about this, just get them stitched down securely. For example, I stitched through the center of each star point instead of trying to stitch around the perimeter of the star. 6. Take the pom-pom trim and loosely arrange in the shape of an oval around the perimeter of the fleece rectangle (the one with the shapes). You will have excess fabric at the corners. Caution – do not actually cut the fleece into the shape of an oval, this makes it harder to stitch together later on. Instead, just shape the trim into an oval shape and pin around the edges. Make sure the pom-pons are pointing towards the center of the fleece. 7. From the front, stitch around the pom-pom trim with your machine. You can use a basting stitch to complete this step more quickly. 8. Take the second piece of unembellished fleece and place it RIGHT SIDES TOGETHER with the piece you just finished embellishing. Pin around the edges. 9. Turn the piece over (pins and all) so you are now looking at the wrong side of the piece with all the felt shapes stitched onto it. With pins, clearly indicate where you will start and stop the seam in order to have a 6 inch opening for turning and stuffing (pick the center of one of the long sides). 10. You should be able to clearly see the stitching line around the perimeter that is securing the pom-poms. Using this seam as a guide, stitch the front and back together just inside this seam (about 1/8″ seam allowance). Again, no need to be a perfectionist about this. Remember to leave 6″ open for turning and stuffing. 11. Trim corners so that you now have a nice oval shape. Turn the paramecium inside out. 12. Stuff with fiberfill. This will use an entire bag of fiberfill! Again, kids can participate in this step and handle the stuffing themselves. 13. Once stuffed, whipstitch the opening closed by hand. 14. Optional: Glue on google eyes or sew on button eyes. My son opted to draw some eyes and mouth in the middle with a marker (can you see it in the picture?). However, he did mention he would like to sew on some buttons for eyes so you can see them better. For another fun project, check out the Radiant Folded Star and Covered Box pattern! This entry was posted in Dolls and Softies, For Kids, Sewing, Tutorials. Bookmark the permalink. Only your son would find paramecium interesting at his age and only you would be able to come up with such a clever idea about paramecium!! Well done. I haven’t ever really thought of a paramecium as being cute but you nailed it! !